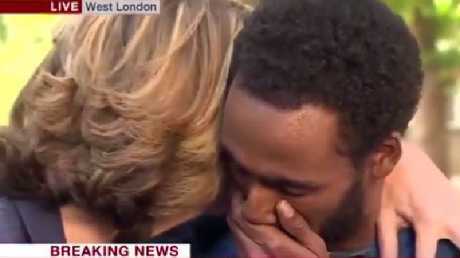 A BBC TV host has embraced London fire survivor Mahad Egal as he broke down describing "horrific" scenes of people jumping and throwing babies from the blaze. Mr Egal, a resident of the Grenfell Tower where 12 people died in the overnight blaze on Wednesday, put his head in his hands and wept as he recalled the dramatic scenes of the tragedy. Clad in a blue tracksuit and standing on the street, Mr Egal was speaking on camera to BBC host Victoria Derbyshire who was forced to cut the interview and embrace Mr Egal as he struggled to speak. "This was really horrific. There's people who were jumping out. There's a man who threw two of his children," Mr Egal said before he became choked up with emotion. Ms Derbyshire pulled Mr Egal to her in a comforting embrace for several seconds, before separating from him but keeping her hand on his shoulder, shaking her head and saying, "Wow". With his eyes still downcast, Mr Egal then said, "We saw a lot, we saw a lot. We saw a lot with our own eyes, we saw ..."
He broke down again and held both his hands up to his face as if to block out the horror. 12 dead in London tower fire: London's Fire Commissioner describes fire as "completely unprecedented". Derbyshire again tried to comfort him with her hand on his shoulder and said, "it's alright, you don't have to say anymore". Other Grenfell residents have described terrifying scenes of their narrow escape from the blaze. Hanan Wahabi fled the building with her husband and their 16-year-old son and daughter, eight. However she last spoke with her brother, who lives on level 21, at 2am on Wednesday. "I told him to leave. He said he was going to come. Then I called him and he said there was too much smoke. "I've not heard from them since." Grenfell Tower fire: Why was cladding added?